Any horse racing fan will know that in the United Kingdom there are many big races in the year but non much bigger than the Cheltenham Gold Cup. This week will be the start of the 2014 festival and this year promises to be the biggest ever in which the crowds will be bigger and the the television viewers being the largest ever. The bookies are going all out this year and are spending an increasing amount on advertising and gimmicks. I have no actual figures of how much is generated in bets over the week but I expect it to be in the millions. The main day of the festival is the Gold Cup day but the days leading up to it are just as big in terms of prize money and as an event in general. The opening day of the festival is always one of the best and this marks the return of the festival from the 12 month wait. This is the day of the festival when women from around the UK and Ireland dress elegantly for the day and make this day truly spectacular. 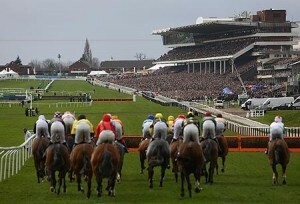 This day can often be better than the main race day because of the large crowd it attracts. Overall a fantastic day to attend. Tickets for the festival range from £30 for the cheapest stand in Best Mate or up to £200 for hospitality on Gold Cup day. The festival attracts over 100,000 people across the week and with the weather for next week expected to be great, the numbers will surely be the best ever. Last year was a washout and therefore organisers are hoping for a good week.